Border Shootout in Starr County between Roma, TX and Rio Grande City, TX. 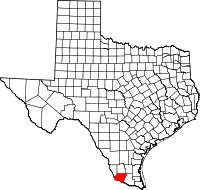 There are not many details available yet, but we know that this afternoon there was a shootout in Starr County Texas that involved Law Enforcement officers and at least 15 armed Mexican Nationals who crossed the border. This is possible spillover Drug Cartel violence. My brother went to the scene to find a blocked off dirt road with dozens of law enforcement vehicles from several different agencies. I called the Starr County Sheriff Department but they could not release any details yet. I called KVEO News 23 and asked if they knew anything. They said that they did not know much yet but that they know there was a shootout and they believe there was at least one Mexican National shot by Law Enforcement.